Author Claire Ridgway has written a very interesting post about Jane Seymour. Was she really the good, innocent and boring woman she's portrayed to be? Bound to Obey and Serve – Jane the Meek and Mild? It is clear from Jane’s motto that she wanted to be the submissive wife and queen, in contrast to the “Most Happy” Anne Boleyn who had a “sunshine and showers” relationship with Henry, one of passion and rages. Antonia Fraser describes her as “naturally sweet-natured” and writes of her main characteristics being “virtue and common good sense”. Fraser goes on to say that “Jane was exactly the kind of female praised by the contemporary handbooks to correct conduct; just as Anne Boleyn had been the sort they warned against,”. However, Alison Weir points out that “Beneath her outward show of humility, there was steel, even though it was confined to the domestic sphere only” – she may have been mild-mannered but she was capable of being strict with her household and also capable of standing up to her husband at times, although her common sense told her when to shut up, i.e. she listened to Henry when he threatened her, by reminding her of what had happened to wife number two, and learned to be submissive to her husband and master. Where Anne would have told Henry just what she thought, Jane curbed her tongue and accepted her place as the dutiful wife, but then she did have the benefit of knowing what Henry was capable of! Henry was bad-tempered and had mood swings and Jane was sensible enough to realise that he needed humouring and needed his ego massaging – where Anne could be impatient, Jane was soothing. 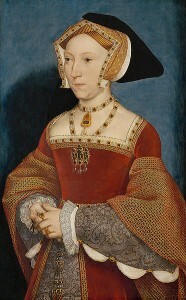 Henry VIII called Jane his true love and true wife, he chose Jane’s image to be portrayed as his wife and queen in the Whitehall Family Portrait, even though he was married to Catherine Parr at the time, and he chose to be laid to rest next to Jane, so it is hard to argue with that and say that she was not Henry’s true love. However, he was only involved with Jane for around 18 months, if that, so the relationship cannot be compared with his marriage to Catherine of Aragon, which lasted for nearly 24 years, and his relationship with Anne Boleyn, which lasted about 10 years. Henry did not have time to get tired of Jane and the fact that she died after giving him the precious gift of a son probably made Henry look back on their relationship with rather rose tinted spectacles! There is no doubt, however, that he loved and respected her and his behaviour after her death, locking himself away from the world, shows that he really was grief-stricken.